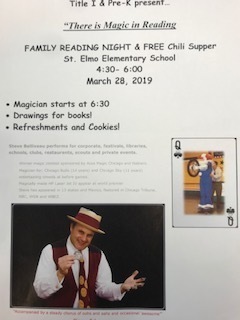 Title I & Pre-K present "There is Magic in Reading"
Steve Belliveau presents his Original Magic Show with zany props especially designed to get laughs. His show is fun to watch and includes music, audience participation and high energy. Plus there’s always the element of surprise! COME JOIN US MARCH 28, 2019!